Bram’s Stoker’s Dracula is set in Romania full of crumbling castles and vampires prowling the night. Though the image is etched into our collective consciousness, Romania packs a different punch for travellers and property investors. Its dramatic, romantic capital is a good indication of how beautiful and interesting the country really is. Romanians are among the friendliest people in Europe, hospitable and eager to share stories. Foreigners will also be pleasantly surprised to find that although Hungarian is the main foreign language, many Romanians speak English and German or French. A quarter of the country is covered in forests, and is home to a vibrant variety of fauna considered to be one of the richest in Europe. The Carpathian Mountains cross the centre of Romania, and create a magnificent panorama. The famed Danube River passes right through Romania after its eight-country trip across Europe, spilling out into the Black Sea, enriching the surrounding hills and plateaus. This accounts for the many fruit orchards, vineyards and farmlands that dot the countryside, harking back to Romania’s historical reputation as Europe’s bread basket in the 1930s. In autumn, the countryside is awash in the warm colours of autumnal foliage, the scenery reminiscent of New England’s. Romania has four distinct seasons. Spring is delightful, with comfortably warm days and cool mornings and nights, ideal for al fresco dining or evening walks. Summer can be hot, especially in the lowlands (with temperatures reaching 100°F from July to August), but one may always visit the surrounding mountain towns for a cool getaway. In summer, the place to be is Mamaia, the Riviera of Romania, along the Black Sea Coast. Though heavy snow during winter is not a constant occurrence in the areas surrounding the Carpathian Mountains, temperatures do tend to drop from December to the middle of March. 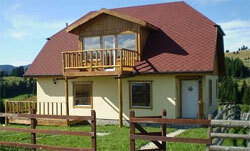 These make for ideal holidays in the skiing resorts of Valea Prahovei and Proiana Braşov. Scattered along the Carpathian Mountains are many medieval towns, home to various landmarks in different historic architectural styles. These include numerous castles (such as Bran Castle, the supposed home of Count Dracula); pre-war buildings; Gothic and Saxon fortified churches, as well those in the Maramures Region, which are remarkably made from wood. All these are amazingly preserved, and several are even included in the UNESCO Heritage Site list. Romania joined the European Union in 2007, and foreign property investment has been on the rise since then. Economic funding to improve infrastructure and to build a more viable business environment has made buying property easier and more accessible. It remains a notable overseas property destination, with its abundant and rustic landscape, its friendly people, and richly tangible historical culture.